SOME PEOPLE THRIVE on situations that would totally disorient others. Supervising large groups of workers seems easy for them. Straightening out mix-ups and inharmonies provides an interesting challenge. A routine job would bore them, but they welcome opportunities to exercise their unusual skills and abilities. Others, confronted by even the simplest problem or the smallest decision, may make themselves ill as a result of experiencing stress, strain and indecision. What is the difference? Why should one person do a job well and another be immobilized by the same responsibility? Most often, worry makes the difference. A great deal of stress may be caused by the individual’s preoccupation with feelings of inadequacy, concern about doing the right thing and a general sense of being overwhelmed by the whole situation — in other words, by worry. To worry simply means “to be anxious, troubled, etc.” (Webster’s New World Dictionary, Concise Edition, 1958, p. 857) It comes from the Anglo-Saxon word meaning “to strangle”. Whenever we allow our minds to become preoccupied with pending decisions, concern about what may happen and feelings of inadequacy, we are subjecting ourselves to a tremendous amount of stress. It is not necessary! 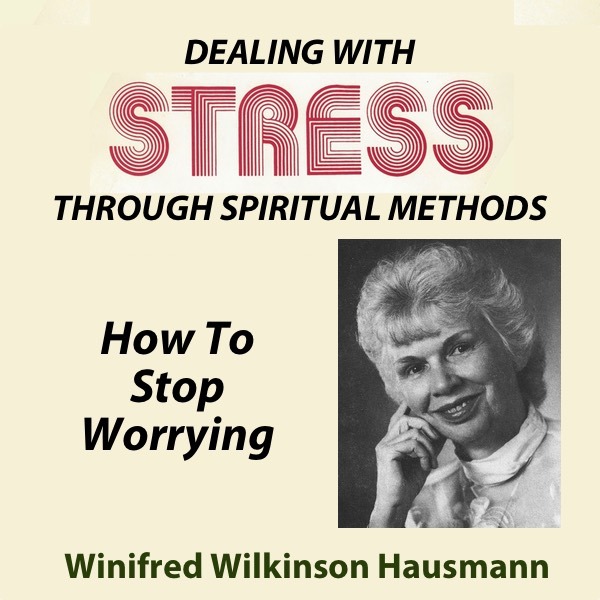 Worry is a habit, and it can be overcome by spiritual methods. Not only that, but we must work our way out of the anxiety habit if we are going to live stress-free, God-fulfilled lives. A woman who had been doing an excellent job was promoted to supervisor. Two weeks later she came in for counselling. She explained, “I see all of these papers piled high on my desk, and I can’t make myself even start to handle them. They are just piling up higher and higher, and I can’t seem to do anything!” she sounded desperate. This was an extreme case of stress, caused by worry about taking on new responsibilities. I suggested that she stop looking at the whole pile of papers, and, instead, think of them as separate items. She was to relax before starting work, get in tune with God in a quiet, definite way and then handle one piece at a time. She returned later to say that things were going well in the new position since she had learned to stop worrying and put God in charge before handling one thing at a time. Many times worry takes the form of concern about something that may or may not ever happen. Probably more energy is wasted on worry about events that never take place than is expended in all the productive effort in the world. There is concern about the possibility of a certain illness, fear about what might happen that would endanger the health and well-being, or just the pocketbook, of an individual, or anxious thoughts about a loved one. Many times worry about a particular situation is the result of discouragement in general. Once the worry bug bites, it becomes like a plague, multiplying itself as long as it finds a welcome. One woman could have saved herself two years of miserable thoughts and fear had she simply nipped her worry bud when it started. As she carried a heavy bag of groceries upstairs to her apartment, she was burdened by many thoughts. She was feeling deeply the recent loss of her father, and she was even more concerned by the suspicion that her brother was “ripping her off” as far as her inheritance was concerned. Through worry she magnified the creak into the thought of costly medical bills, and that brought her right back to the sense of financial loss over what her brother was doing about the father’s estate. She tried to meditate, but somehow couldn’t get over the fear. All sorts of negative pictures filled her mind, as she went over and over what might be wrong. Finally, after two years of fretting and worry, she decided to consult a doctor. It was at this point that she picked up the January, 1982, issue of Unity Magazine, containing my article “Don’t You Believe It!” At first she was amused by the story of the lady who, when told she had a serious physical ailment, was advised by my husband, a Unity Minister, “Don’t you believe it!” The article went on to show how our refusal to believe in physical difficulties can bring about healing. After two years of concern and anxiety, in a moment the whole thing was cleared up for her. But it didn’t happen until she first got rid of the worried state of mind and became receptive to her answer. How often the worried attitude simply puts up a shield to preserve the anxious state until something happens to break through and awaken the consciousness to a higher, better answer! We can’t hear unless we listen, and we won’t listen until we are ready, mentally, for a different concept. When we consider the effects of worry, surely we must see that nothing is worth allowing that stress and strain on our minds, our bodies and our affairs. Worry has been described as a “respectable way” of killing yourself, but, even in its less lethal form it does tremendous damage. Worry makes young people old, and it weakens older people by destroying the appetite, causing insomnia, spoiling the taste for living, warping the personality and sapping the energy. It is, in effect, a costly luxury, an indulgence that takes its toll. Whether worry concerns itself with what has happened, what might happen or what is happening, it accomplishes no good purpose and simply drains the organism of the power it needs for coping with the source of the stress, real or imagined. A certain sense of negative self-indulgence may seemingly satisfy the worrier, but its cost is great! Worry is not something that happens to us. It is a response that happens through us. It may be our reaction to an outer stimulus, or it may simply result from a buildup of our own negative thoughts and feelings. But, however it comes, it must be stopped if we are to live happy, healthy, successful, productive lives. One of the negative results of anxiety is that we frequently attract the very thing that we would most like to avoid. If we continue to pour thought power into negative concepts, we are literally forming them from the stuff of the universe. Even if we concentrate on something that has already happened, with worry about it, we will find that the undesirable state of affairs becomes worse, all through the power of our thought. For many people, worry becomes a form of intoxication — one that is considered quite respectable. People who would never consider losing control of themselves as the result of drinking too much alcohol may think it is perfectly all right to become drunk on worry. And they do. We can take a lesson from the animals. The human being is the only form of life on our planet that has the ability to worry. Only a person can anticipate something with foreboding and then continue to relive it with strong emotional imaging when it is over. Animals arise to the occasion when an emergency arises and then relax when it is over. They are able to do this because they trust and depend on their instincts. How much better off we would be if we also would trust our inner spiritual guidance instead of trying to anticipate or review real or imagined challenges! Mac, our little border collie, used to love to sit on the hill in front of our house, alert and watching, but relaxed. When another dog came in sight, he would prick up his ears and watch intently. If the other dog so much as stepped on our property, Mac would bark furiously and run as far as necessary to chase the intruder from his land. After sniffing around a bit to make sure everything was all right and the invader was really gone, he would return to his vantage point, relax and wait for the next emergency. No worry. No anticipation. Just response to the God nature within him. Worry is a learned response, but it can also be unlearned. Paul tells us how in his letter to the Philippians. Two other modern translations actually use the word “worry”. J. B. Phillips says, “Don’t worry over anything whatever” (Phil. 4:6 Phillips), and George Lamsa translates Paul’s words, “Do not worry over things” (Phil. 4:6 Lamsa). All in all, the instruction is clear. Don’t review your troubles or anxieties. As most people who have become chronic worriers will agree, this is easy to say, but difficult to accomplish. However, it can be done, if we make up our minds that our healthful feelings and fulfilling participation in life are worth whatever they cost in discipline and re-training of our thoughts and feelings. Concentration intensifies and concentrates. Release frees. This works in our thoughts and feelings as it does in our affairs. When we choose the type of thoughts with which we will live most of the time, we form thought centers in our minds, which attract other thoughts and feelings of like nature. Thus, if we begin to worry about the possibility of a certain thing happening, we build a center which acts as a magnet to draw into its orbit all sorts of ideas and concepts to reinforce it. By the same token, if we start out with a happy attitude and a peaceful feeling, we may be surprised at the number of happy happenings we attract that day. If we want to change the results, we must change the cause, because that is where the center originates. If we start off with fearful, anxious thoughts, they will do their work of not only attracting more anxiety and fear, but also they will draw to us those experiences that we most hate and want to avoid. That is the way the law of mind works. In order to stop reviewing troubles or anxieties — in other words, to stop worrying —- we must be willing to take a mature responsibility for our lives. We can no longer claim that something someone said or did “made” us worry. We must acknowledge in a mature way that we determine what we will think, and we can choose not to fill our minds with negative, anxious concerns. Then we must do it. A woman was feeling badly and went to her doctor. After examining her, he said he was sure there was something wrong with her liver and he wanted to put her in the hospital for tests. At first she was very worried, but then she decided to take control of the situation and not to accept the doctor’s prognosis. Remembering that there was intelligence in all the cells of her body, she went home and started talking to her liver. To the amusement of her famiy, she walked around the house, declaring out loud, over and over, positive, powerful orders to the intelligence in her liver. She would start off, “Liver, you know what you are supposed to be doing. Now get up and do it!” Then she would go on from there, remembering continually to hold the thought that the intelligence in her liver was listening to every word she said. By the time she went into the hospital for tests, she was feeling fine, and she knew the results would be negative. As an added bonus, her family, having been amused at her performance, had not added worry and anxiety to the negation that she had to overcome. They were actually helping her to express a positive, optimistic outlook in the whole situation. No one has to worry. Anyone can choose not to go back over troubles or to anxiously anticipate difficulties. And it’s the only mature choice anyone can make! Give thanks to God for your blessings. How easy it is to concentrate on the things that we don’t have and completely ignore the many blessings that surround us. In our modern affluent society we all take for granted many conveniences that would have been beyond the imagination of our ancestors. When Paul spoke of praying with thanksgiving as we open ourselves to the fulfillment of our greater desires, he was instructing us to develop a healthy attitude that will enable us to experience God’s presence so strongly that we will be able to accept the good He has provided for us. We cannot expect answers to prayers of complaint and misery. God has already richly supplied all that we can ever need or want, but we must be in tune with it in order to bring it forth into visible form. A spirit of thanksgiving wipes out the fear, the worry, the anxiety, and enables us to appreciate the good that we already have as preparation for receiving the greater good God has for us. And there is nothing like giving thanks in advance for the blessings we are seeking. When we turn in prayer to God with a spirit of thanksgiving not only for the good we have already received, but also for the healing or prosperity or other good that we know He has for us, we will find that worry disappears. The more we identify with the good that we already have received and the good that we are accepting in advance, the further we are moving from worry and concern. It’s our choice. We can decide to worry, but how much better off we will be if we just decide to be thankful instead! Fill your mind with positive, powerful thoughts of good. It’s a short step from thanksgiving to an attitude of positive, powerful, joyous, enthusiastic participation in life. And when we are tuned in to the good, we will be forming a thought center which attracts only love and joy and beauty into our daily experience. As we think, we attract, and when our mind is trained to think in a positive way, it will no longer be receptive to worry thoughts. They just won’t fit. Paul even tells us what sort of thoughts to choose in order to develop this positive, powerful, attracting consciousness. These are perhaps some of his best known words: “Finally, brethren, whatever is true, whatever is honorable, whatever is just, whatever is pure, whatever is lovely, whatever is gracious, if there is any excellence, if there is anything worthy of praise, think about these things.” (Phil. 4:8 RSV) When we have formed the habit of making sure that all our thoughts and feelings pass this test, then we will find that somehow our whole attitude is harmonious and happy, and our affairs are happy, too.